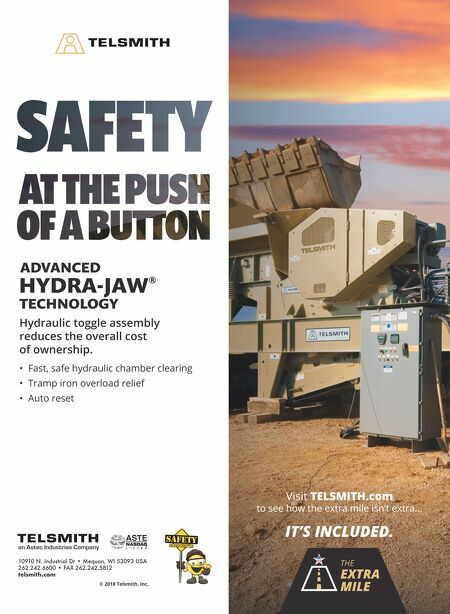 72 E&MJ • JUNE 2018 www.e-mj.com COMPANY PROFILE-PAID ADVERTISEMENT Telsmith provides a full range of integrated processing solutions to the mining industry with cone crushers, jaw crushers, vibrating equipment, portable plants, track plants, as well as full-scale mod- ular processing facilities. Telsmith consistently demonstrates a commitment to customer needs throughout the product lifecycle, from experienced appli- cations engineers designing a solution that enables customers to meet business goals, craftsmen utilizing the latest advances in manufacturing technology, on-site factory start-up teams, on through to parts and service to keep equipment running for decades, Telsmith continues to meet the growing demand for min- eral processing equipment around the world with safe, efficient and profitable solutions. Global Processing Solutions T-Series™ Telsmith T-Series™ Cone Crushers are engineered to deliver un-compromising productivity, safety and ease of maintenance for maximum uptime in tough, abrasive mining applications. • Currently available in 4 sizes (T300, T400, T500, & T900). • Output capacities ranging from 135 to 2,134 metric tons per hour (depending on desired final output size). • Up to a 381mm (15-inch) feed size, rated largest-in class clear- ing stroke. • 220kw (300hp) to 660kw (900hp) performance, highest-in-class crushing force. T-Series™ Cone Crushers have large clearing circuits, and are designed to safely and quickly allow uncrushable materials to pass, avoiding costly damage and associated downtime for repairs. A patent-pending, anti-spin feature prevents head spin to help extend manganese service life. Like other key components, it's mounted on top of the machine for safe, top-service access. T-Series™ Cone Crushers anti-spin operates with pressure lubrication oil, eliminating the need for a gear box, separate hydraulic circuit and associated maintenance. The use of a single bowl for all liners over its range of operation helps reduce downtime and inventory costs while allowing optimum versatility, flexibility, and efficiency in any mining application. Telsmith Hydra-Jaw ® The Telsmith Hydra-Jaw ® models combine a century of experience with the most advanced jaw crusher technology available today. The result is a reliable, highly productive line of jaw crushers that are safe to operate, easy to maintain and deliver greater uptime availability. Now available in four sizes: 2238, 2550, 3244, 3450. Incorporating a unique hydraulic toggle, the Hydra-Jaw ® pro- vides functionality not available on traditional jaw crushers. • Hydraulic Adjustment practically eliminates adjustment down- time. Fingertip controls allow operators to adjust the crusher whenever it will benefit production and not have to wait until maintenance time allows. • Automatic Overload Relief allows owners to avoid the expensive downtime and repairs that can result from tramp metal entering the crusher. • Hydraulic Chamber Clearing allows the operator to safely clear the crusher, from a location, eliminating downtime and keeping employees safe. Crushing operations can resume in minutes fol- lowing an emergency stop. 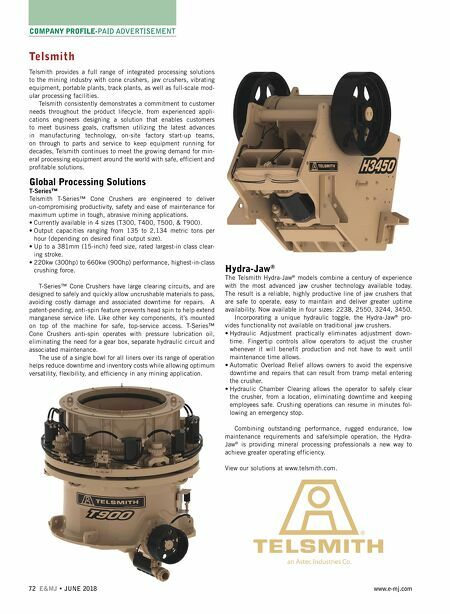 Combining outstanding performance, rugged endurance, low maintenance requirements and safe/simple operation, the Hydra- Jaw ® is providing mineral processing professionals a new way to achieve greater operating efficiency. View our solutions at www.telsmith.com.